The train has just left Ulan-Ude (we are still on time!) after a 40 minute stop, our longest so far. Overnight we passed through Irkutsk and have covered another 1200 km since this time yesterday. We seem to have a fresh engine each day – still on overhead electric at the moment, but changing to diesel tomorrow. 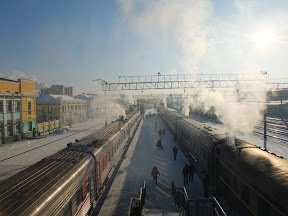 We came in alongside the Russian Trans-Siberian “Rossiya” train which I think goes on to Vladivostok – but we soon part company and branch off this line soon to start heading South, bound next for Ulan Bator (or “UB”). 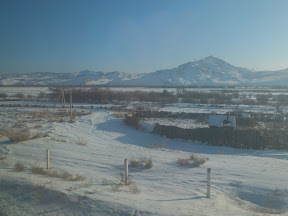 The scenery is starting to change as we approach the Mongolian border. 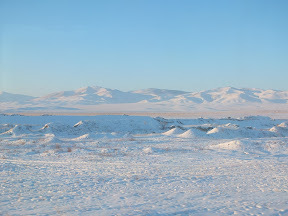 There are now vast frozen rivers and mountains ahead in the distance – all that lies between us and the Gobi desert. I didn’t sleep to well last night, partly due to it getting quite hot, party due to the amount of beer drunk and party due to another two hours time change – I have now caught up with local time, Moscow time +4 hours. 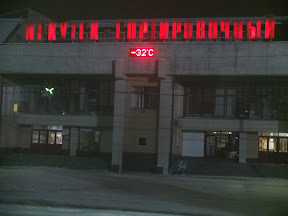 I popped my head out near Irkutsk – it was -32 C on the platform. A bit nippy! 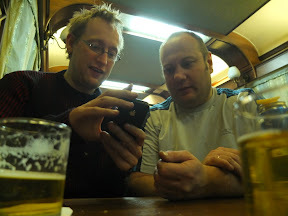 A new character appeared in the bar last night in the shape of Dimitri, a para medic from Ulan-Ude. It was a near escape from oblivion, as he was unstoppable on the toasting front – at least 50.. Also amazing how far you can get in a conversation with an iPhone dictionary, a sense of humour, and some comedy miming. In passing I’m slightly worried that I might have accidentally placed an order for some unique fish from Lake Baikal, and the locals have it salted and apparently its very smelly..
After supper (smoked salmon followed by pork escalope) Stephan and I visited the Russian sector to see how they live, which we discovered now only comprises of one single carriage. 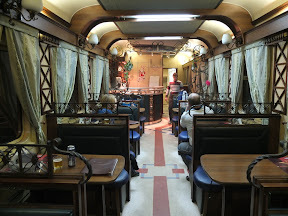 It has a proper Provodnitsa, and she was concerned we might accidentally fall out the end of the train! On gadget news, you may like to know that I have finished building the Mark 2 heat shield to cool down my compartment. All you need to make this at home yourself is 10 metres of aluminium foil and some gaffer tape. It’s more effective than the Mark 1 as it is 10 sheets thick and covers the whole length of the radiator. 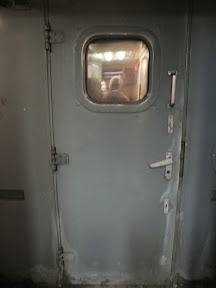 I counted the number of doors I have to contend with from my compartment to the restaurant carriage last night – 25 including the inner and outer doors. My technique is improving though and I’m getting faster, which is good as I’m dressed in shorts and flip flops and would not last long at the temperature outside. 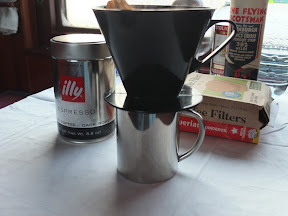 I’m now enjoying some reasonable coffee and some amazing scenery as we begin to climb through the mountains.